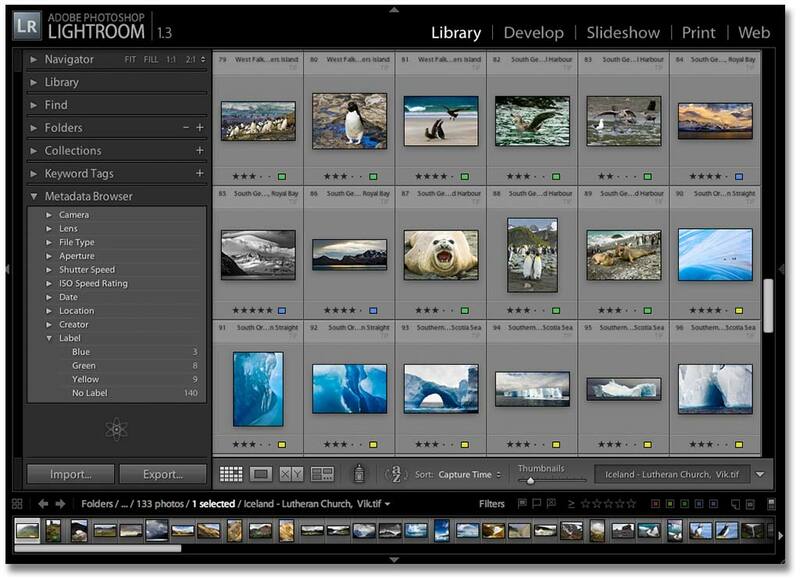 So, here we are at Lightroom version 1.3 and the question most users will be asking is - what's new? On the surface very little, but just like an iceberg there's lots beneath the surface. An issue with the preference to automatically write metadata to XMP has been corrected, so the performance degradation that some users experienced should be reduced. Printing with the native resolution option enabled no longer sets the wrong dimension for portrait oriented photos. Prior to Camera Raw 4.3 there was the possibility that artefacts in edge transitions could be introduced through the Bayer demosaic and luminance noise reduction algorithms. This has been corrected. Apple Max OSX 10.5 (aka Leopard) is now supported. Note that some print drivers still need to be updated before full functionality is available in Lightroom. New context menu options in Library panel for imports from disk and catalogs. The export dialog layout has been enhanced. Overall little has changed within the main window, but a clicking around the UI will expose a few new context menus (see figure 2 below). Whether these menus actually turn out to be useful really depends on how you use Lightroom screen modes (e.g. full-screen mode). I think it goes without saying that the single biggest pain point of Lightroom has been the performance degradation that comes with the use of the "Automatically write changes into XMP" functionality (figure 3). In fact, many users found Lightroom was almost unusable when this preference was on. The good news is that 1.3 includes fixes for the underlying problem, so most users should see significantly better performance than before. 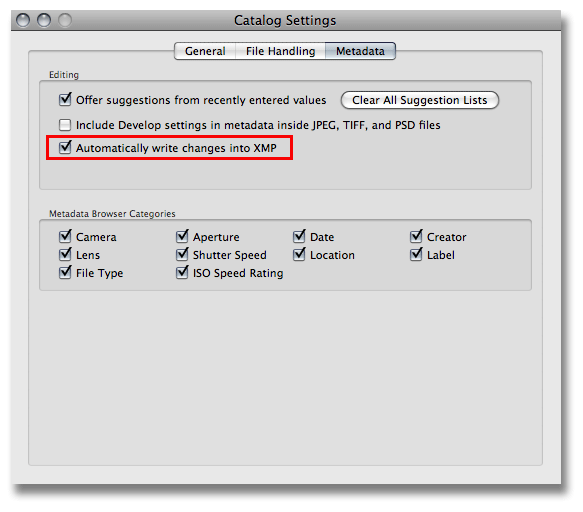 Even so, it's probably best that you leave this preference unchecked, that is unless you a have a specific requirement for all of your Lightroom applied adjustments and metadata to be written into the XMP header of your photos. The Import dialog (figure 4) has been enhanced slightly with the introduction of the 1:1 preview option. Had this option been available in earlier versions of Lightroom, the actual time required for the "import" process to complete would have been excruciatingly long. Fortunately, the engineers have reworked the import logic in 1.3 so that standard-sized and 1:1 preview rendering is delayed until all of the photos have been imported, although those thumbnails that are visible within the grid area will be rendered up front. Likewise, if you begin to browse through photos before the import is complete some amount of preview building must take place, otherwise you will end up with grey thumbnails. Overall, preview rendering speed hasn't been improved, but the new changes at least give the user greater flexibility in terms of when 1:1 previews are rendered. Some readers may recall that many of the complaints after the release of Lightroom V1.1 were related to catalog or database corruption. Fortunately, Adobe was quick to help out users who sought assistance on the Lightroom User-to-User forum. In the vast majority of case the corruption was easily and quickly fixed. Nevertheless, it's probably fair to say that some Lightroom users didn't realise that help was available and very likely lost their existing catalogs. Obviously, Adobe did not wish a repeat of the problem, so they extended the catalog integrity checking facilities to include repair functionality. From a user perspective the actual process of repairing the catalog is fairly straightforward. The following series of screenshots shows the dialogs that a user will see if Lightroom detects a catalog problem that needs to be repaired. It's worth noting that unless Lightroom actually encounters a corrupt catalog it highly unlikely that users will see above dialogs. Existing users will quickly notice a new look to the Export dialog (figure 9). Apart from the new look, the most obvious addition is the much requested "Don't Enlarge" checkbox and "Resize to Fit" in lieu of the previous "Constrain Maximum Size" option. Overall, I think the resizing options should be easier to understand and use. A less obvious but nevertheless important change to the export dialog is the ability to import, export and update export presets. This is achieved via context menus that appear when you Ctrl+click (Mac) or right-click (Windows) the existing presets. Probably the most significant and long awaited feature addition in Lightroom V1.3 is the Export Software Develop Kit or SDK for short. I should point out that I have not had the opportunity to work with the SDK, but that doesn't prevent me from being excited by the possibilities it offers. Adobe will be providing a dedicated area on their Adobe Labs forum. The following is a snippet from the labs page, I will post a link to the actual page when it forum goes live. 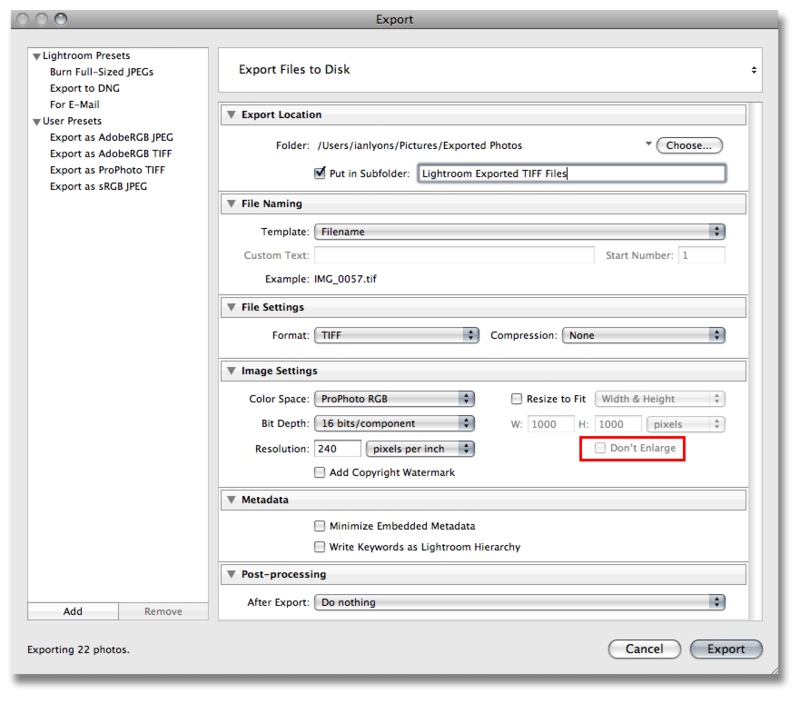 Welcome to the Adobe® Lightroom™ Export SDK preview release on Adobe Labs. This public prerelease provides a Software Development Kit that will allow developers to enable communication from the Lightroom 1.3 Export Dialog to third party tools, web sites or devices. Using the SDK and an IDE of your choice will allow you to create Export plug-ins that further streamline the photographic workflow. 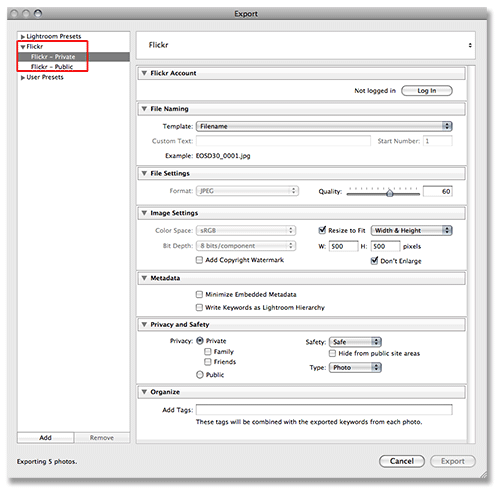 This SDK, based on the open source Lua language, includes plug-in sample code for a Flickr and FTP plug-in that demonstrate how to extend the Export dialog interface for specific tasks. 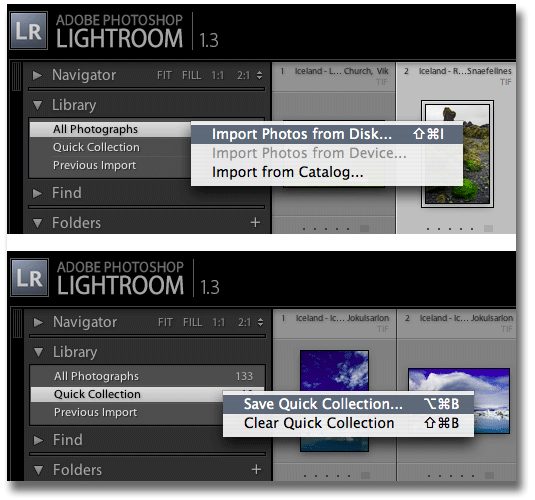 The Lightroom Export SDK preview is the Lightroom product team's first opportunity to engage the developer community. While this preview SDK functionality is limited to the Export dialog, the discussion on the lab forum should be expanded to include any functional area that a developer would like to build upon. The following screenshot shows the new Export dialog when the sample SDK code for the "Flickr" photo sharing service has been installed. Readers who recall the debates surrounding the luminance noise reduction enhancements introduced with Lightroom 1.1 will be pleased to note that the Camera Raw team have continued to refine these. The net result of their work is that most obvious artefacts that remained after the 1.2 update have now been eliminated. Whether these changes are sufficient to satisfy the most vociferous critics of Lightroom and Camera Raw luminance noise reduction is another matter. 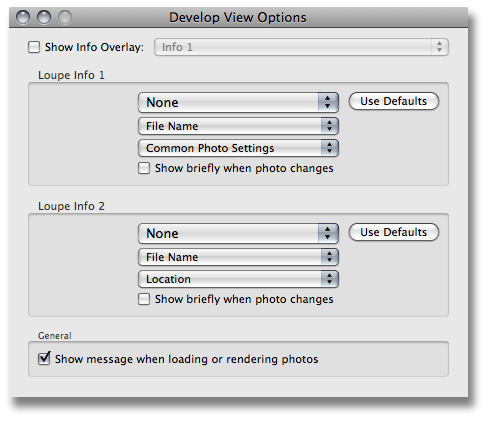 Last but not least is the much requested preference to disable the overlay messages that appear when raw photos are being rendered in the Develop module. There are also a few new metadata options available from the Loupe Info popup menus.